I am so excited to finally share my newest project with you guys! My friend Kindra and I have been slowly working away between naps and homework for months, but her gorgeous new fireplace, hearth, and over-mantle are finally done! 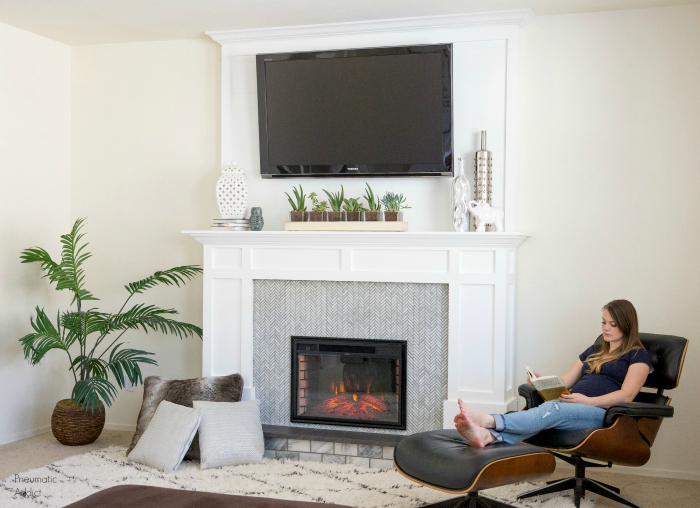 You've probably seen electric fireplaces before, but you've never seen a set-up like this! 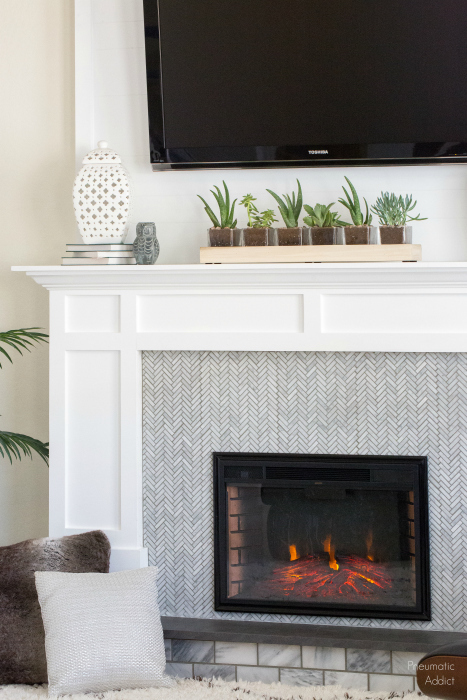 It may not look like it, but this faux fireplace is renter friendly! You can separate the three pieces and take the whole thing with you when you move. All that will be left behind are a few screw holes, which can be easily filled. The overmantle can easily support a 55" TV. Honestly, you would have no idea the whole fireplace wasn't "built in" unless I told you so. Kindra is easily one of my coolest friends. Not only is she a super talented photographer/videographer (hence all the beautiful photos you'll see in this post), she is super curious and loves trying new things. She's never built anything like this before, but she rolled up her sleeves and did a large amount of the work on this bad boy. She totally killed it! The fireplace as a whole is a pretty large project. I've decided to share the plans for each section (hearth, fireplace, and overmantle) in separate posts so I can be sure to include enough details. Today I'm showing you how to build the hearth, or base of the unit. (2) 1 x 6 x 96"
(1) 1 x 6 x 72"
(1) 2 x 6 x 96"
(2) 1 x 6 @ 83-3/8"
(2) 1 x 6 @ 17-5/8"
(4) 2 x 6 @ 16-1/8"
(1) 3/4" plywood @ 17-5/8" x 84 7/8"
(1) Ikea "EKBACKEN" countertop @ 19-1/8" x 87-7/8"
1. The first step is to cut all your pieces of wood to length. 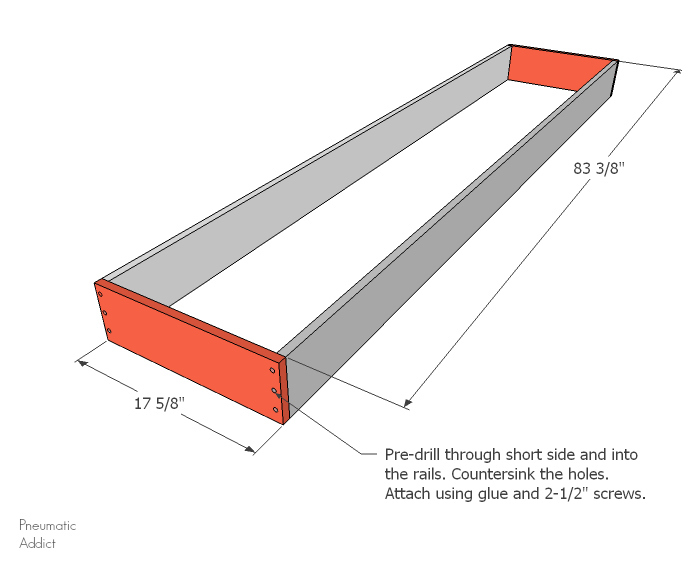 Pre-drill through the shorter, end pieces and into the ends of the long rails. Attach all four pieces together using glue and 2-1/2" wood screws. Make sure that all the screw heads are countersunk below the surface. 2. 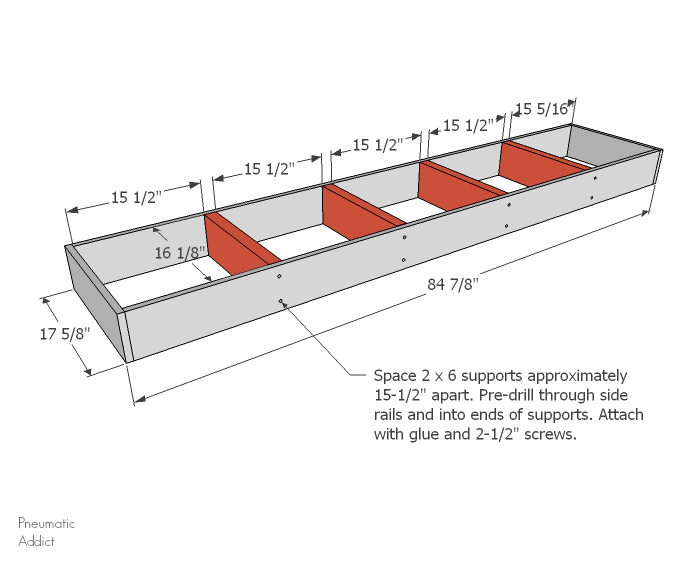 Space the 2 x 6 supports approximately 15-1/2" apart, between the rails. Pre-drill through the rails and into the ends of the support. Attach, using glue and 2-1/2" wood screws. Make sure that all the screw heads are countersunk below the surface. 3. Place the 3/4" plywood top on the frame and align the corners. Secure in place, using glue and 2-1/2" screws spaced about 6" apart. Once again, make sure the screw heads sit below the wood's surface. 4. At this point, you'll want to apply your tile or stone to the front and both sides. We chose 3" x 6" marble subway tiles from The Home Depot and used 1/4" grout lines. It worked out perfectly so we could run 2 courses of tile and avoided having to rip down small pieces. We did have to cut a couple pieces on the ends, but it was a pretty simple. Once the tile is set and grouted, set aside and allow everything to dry. 5. I searched for a long while for the perfect material for the top or "hearth stone". Kindra really wanted the look of traditional bluestone or soapstone. Not only would real stone have been very expensive, it is also very heavy! Knowing the fireplace will be picked up and moved at some point, I tried to find another option. I came across the Ekbacken countertop which comes in a gorgeous, faux-concrete finish and is available in a long enough length. 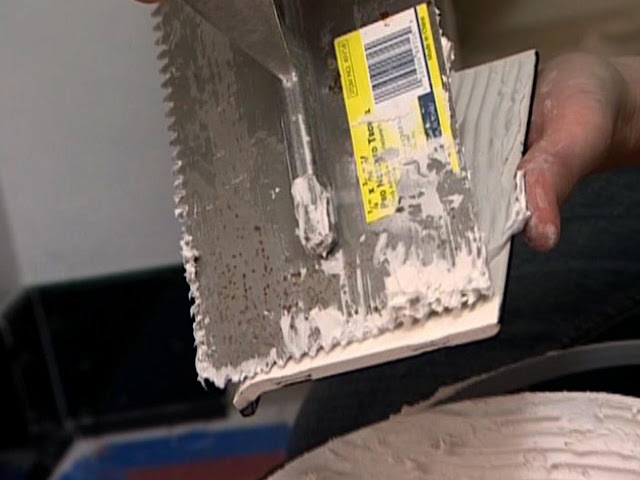 To avoid the laminate from chipping, place masking tape over the location where the cut will be. More importantly, flip the countertop upside down, or use a reverse tooth blade. Take your time and cut slowly. 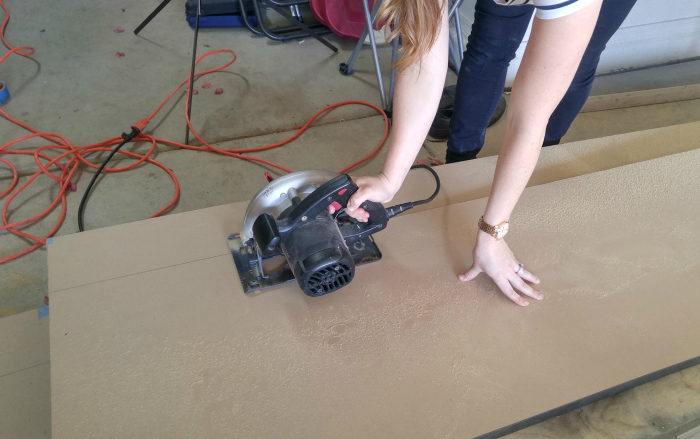 Follow the instructions included with the countertop to cover raw edges with the provided strips, using contact cement. 6. 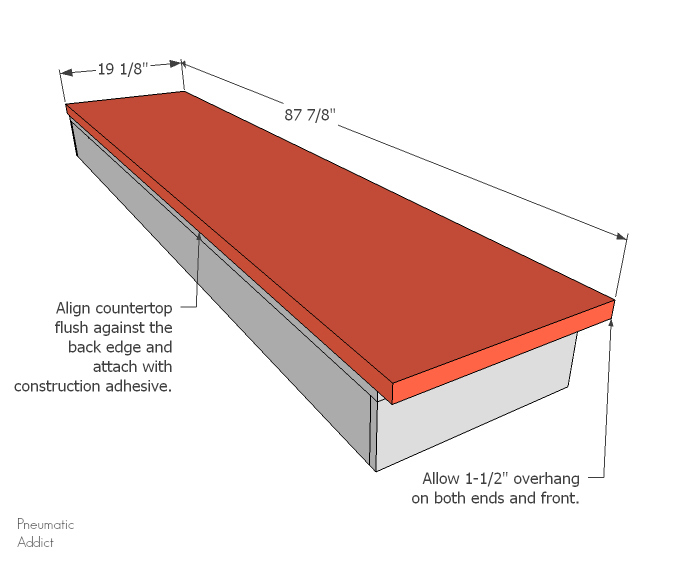 Align the countertop flush against the back edge of the hearth. 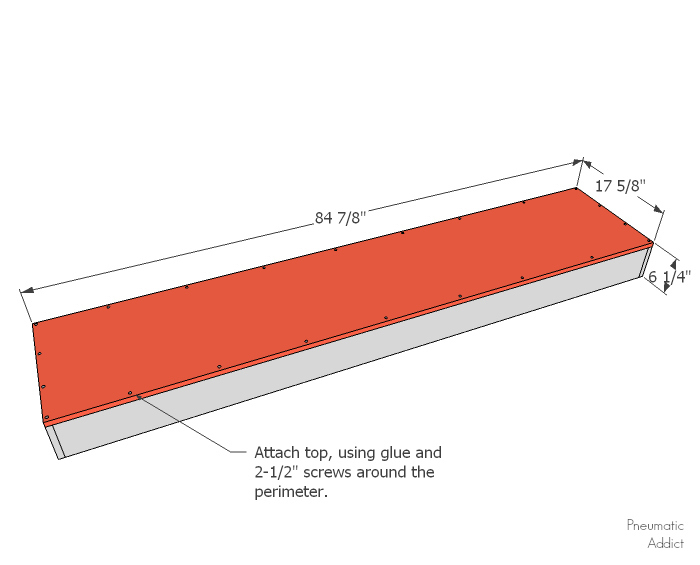 Allow a 1-1/2" overhang (not including the tile) on both sides and front edge. 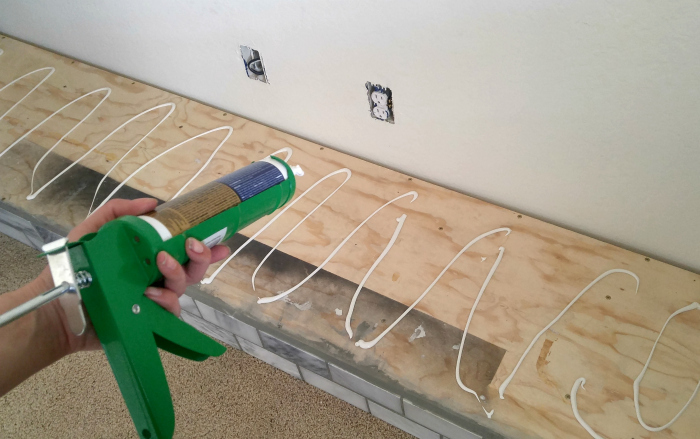 Secure the countertop in place using construction adhesive. 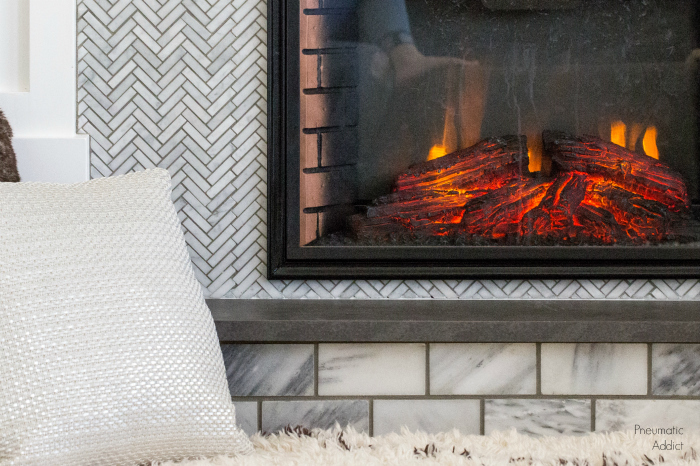 Once the adhesive is dry, your fireplace hearth is done! You can sit back and admire your hard work, but I know you're dying to build the rest. Don't worry! I'll be sharing the next step (the fireplace body) tomorrow. See, I told you the photos are gorgeous! I owe big thanks to Kindra. If you live in the Southeast valley and need amazing photographer or videographer, check out her work. If you're ready to get started on your own movable faux fireplace, pin the image below and check back tomorrow for part two! Shazam!!! Two talented ladies combine forces! I love this tutorial. Trying to figure out which wall of my home can have a fireplace now.